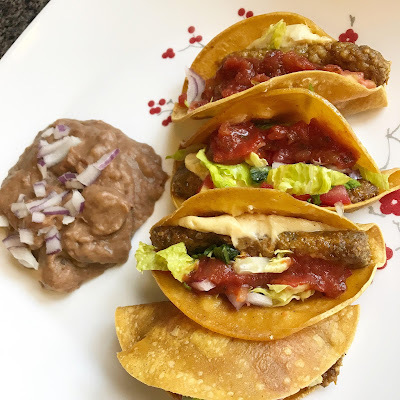 I’ve been seeing these Carla Lee’s Nut Tacos — and other Carla Lee’s vegan nut-based meats — in the freezer section at grocery stores forever. But they were a little too pricey for me (close to $7 for a box with two servings), so I’ve never bought them. Until last week when I caught them on clearance at Kroger for $3.30 a box! Each box contains 8 mini tacos (4 per serving) — corn tortillas stuffed with a taco meat made from brown rice, sunflower seeds, cashews, carrot juice, and coconut aminos. I was excited to see they’re made entirely of whole foods! I also love that 4 tacos is a serving because it’s actually a substantial amount of food. These can be cooked in the oven, in a skillet, or in the microwave. And though the package doesn’t say it, I’m guessing the air fryer would work well too. But I had mine for dinner last night after a run, and I had plenty of time to crank up the oven. So I tried them that way. You cook these for 8 minutes on one side, stuff with cheese, flip, and cook for another 4 minutes. I stuffed mine with some leftover homemade cashew cheese for an extra nutty taco! Once they were done cooking, I added salsa, lettuce, tomato, and red onion. And I served mine with Sprouts Farmers Market brand fat-free refried pinto beans. Y’ALL. These were so good! Seriously the best frozen entree I’ve ever had. They’re so good that they’d pass for homemade if you served them as apps at a party. The nut meat is well-seasoned and has the consistency of any homemade nut meat I’ve ever tried. The nuts and rice are ground together, so you don’t get too much texture off any one ingredient. And the little corn tortillas get crunchy in the oven. Perfection. Next time I see these offered at full price, I will not hesitate to pay $7 for them. And there are other Carla Lee’s nut products that I want to try now — nut burgers, nut balls, and though I’ve never seen them for sale around here, Nut Corndogs (!!!!!). Previous articleVegan Brats! Philly Wraps! Curry Tofu Salad!